In this case study, you’ll learn how Elasto Proxy provides complete sealing solutions to manufacturers of water filtration systems. Rubber gate seals start with seal design and compound selection, are crafted with water jet cutting and infrared splicing, and add value with inventory management and shipping. In wastewater treatment plants, metal gates are bolted to concrete frames to control flow and channel the effluent for disinfection. To prevent leakage, a rubber seal is fitted to the bottom of the frame. This seal attaches to the gate with bolts, and must withstand prolonged exposure to water and contact with a concrete base. In water filtration systems that use ultraviolet (UV) light, UV resistance is essential. When a manufacturer of water filtration systems wanted a custom gate seal, Elasto Proxy provided more than just a replacement part. First, our solutions providers listened to the manufacturer’s requirements and analyzed all of their needs. Our technical team then applied its expertise in compound selection, and identified a seal design that could solve the manufacturer’s specific sealing challenge. Next, our skilled production personnel in Boisbriand, Quebec used water jet cutting and infrared (IR) splicing to craft a custom sealing solution. Yet that’s not where this case study ends. Today, Elasto Proxy stocks rubber gate seals for water filtration systems at our warehouse in Newmarket, Ontario. 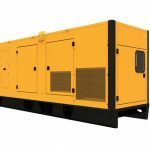 To meet our partner’s business requirements, we ship quantities according to their annual sales forecasts. Elasto Proxy has the application knowledge and technical expertise to improve your seal or gasket design to meet demanding service conditions. For the manufacturer of water filtration systems, the bottom seal on the metal gate was an existing rubber part that needed stronger joints and better contact sealing. Proper compression and recovery were critical, too. 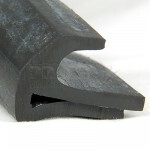 The manufacturer’s current part, a large P-shaped profile, was made of natural rubber and measured nearly 2-inches high and 4-inches wide. To promote compression, this thick rubber seal had a hollow center yet still required a significant amount of force. 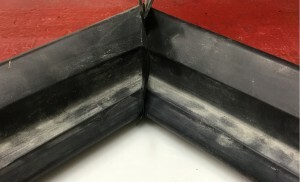 The gasket’s corners were probably joined with cold-bonding, a cost-effective splicing method that’s best suited for applications other than UV water filtration. By checking the applicable regulatory requirements, Elasto Proxy determined that natural rubber wasn’t required for this custom gate seal. This allowed our solutions providers to recommend a 60-durometer EPDM lip seal or J-seal instead. Unlike natural rubber, EPDM has excellent UV resistance. 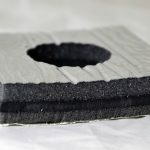 EPDM also withstands abrasion, an important consideration for a seal contacts a concrete base. 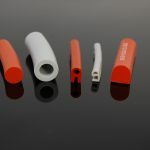 The 60-durometer J-seal that we recommended also has the required hardness and shape for proper compression resistance. Next, Elasto Proxy applied its custom fabrication expertise. To produce a pattern of bolt holes for attaching the rubber seal to the metal gate, we used our water jet cutting machine to make fine, fast cuts. Unlike die cutting, water jet cutting doesn’t require expensive tooling. Water jet cutting also supports quick-turn prototyping, and can also produce production-quality parts in low-to-medium volumes. To produce strong bonds and support the lip seal’s large size, our skilled production personnel used our infrared splicing machine. Elasto Proxy offers several different splicing techniques, and each joining method has distinct advantages. Infrared splicing is faster than cold bonding, less expensive than molding, and makes it easy to hold down large, complex shapes. Infrared splicing also creates the kind of strong bonds that can withstand the conditions found in UV water filtration systems. Do you need rubber gate seals for water filtration or other water-related applications? Would you like to learn more about compound selection, seal design, water jet cutting, or infrared splicing? What about inventory management or shipments based on your annual sales forecasts? For complete sealing solutions, Elasto Proxy has the knowledge and experience that you need. 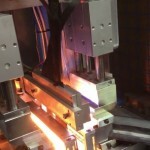 High-Performance Thermoplastics (HPTPs): Are They Worth It?